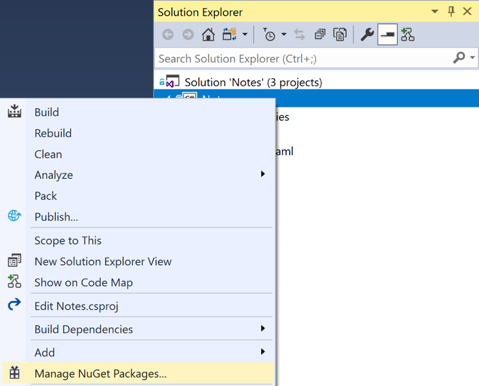 Use the NuGet Package Manager to add a NuGet package to a project. Store data locally in a SQLite.NET database. Despite the package name, this NuGet package can be used in .NET Standard projects. This package will be used to incorporate database operations into the application. 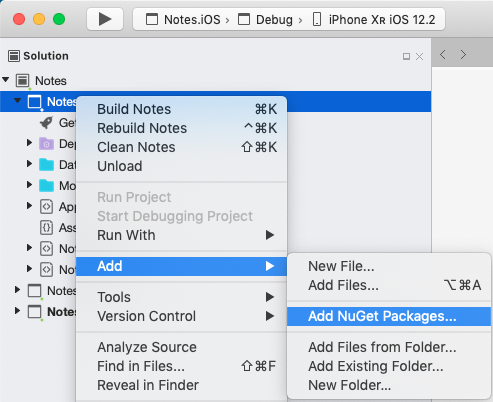 This class defines a Note model that will store data about each note in the application. The ID property is marked with PrimaryKey and AutoIncrement attributes to ensure that each Note instance in the SQLite.NET database will have a unique id provided by SQLite.NET. Save the changes to Note.cs by pressing CTRL+S, and close the file. Attempting to build the application at this point will result in errors that will be fixed in subsequent steps. In Solution Explorer, add a new folder named Data to the Notes project. In Solution Explorer, in the Notes project, add a new class named NoteDatabase to the Data folder. This class contains code to create the database, read data from it, write data to it, and delete data from it. The code uses asynchronous SQLite.NET APIs that move database operations to background threads. In addition, the NoteDatabase constructor takes the path of the database file as an argument. This path will be provided by the App class in the next step. Save the changes to NoteDatabase.cs by pressing CTRL+S, and close the file. This code defines a Database property that creates a new NoteDatabase instance as a singleton, passing in the filename of the database as the argument to the NoteDatabase constructor. The advantage of exposing the database as a singleton is that a single database connection is created that's kept open while the application runs, therefore avoiding the expense of opening and closing the database file each time a database operation is performed. Save the changes to App.xaml.cs by pressing CTRL+S, and close the file. This code populates the ListView with any notes stored in the database. Save the changes to NotesPage.xaml.cs by pressing CTRL+S, and close the file. The NoteEntryPage stores a Note instance, which represents a single note, in the BindingContext of the page. When the OnSaveButtonClicked event handler is executed, the Note instance is saved to the database and the application navigates back to the previous page. When the OnDeleteButtonClicked event handler is executed, the Note instance is deleted from the database and the application navigates back to the previous page. Save the changes to NoteEntryPage.xaml.cs by pressing CTRL+S, and close the file. On the NotesPage press the + button to navigate to the NoteEntryPage and enter a note. After saving the note the application will navigate back to the NotesPage. Enter a number of notes, of varying length, to observe the application behavior. Save the changes to Note.cs by choosing File > Save (or by pressing ⌘ + S), and close the file. In the Solution Pad, add a new folder named Data to the Notes project. 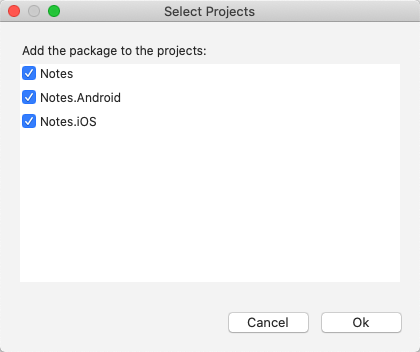 In the Solution Pad, in the Notes project, add a new class named NoteDatabase to the Data folder. Save the changes to NoteDatabase.cs by choosing File > Save (or by pressing ⌘ + S), and close the file. Save the changes to App.xaml.cs by choosing File > Save (or by pressing ⌘ + S), and close the file. Save the changes to NotesPage.xaml.cs by choosing File > Save (or by pressing ⌘ + S), and close the file. Save the changes to NoteEntryPage.xaml.cs by choosing File > Save (or by pressing ⌘ + S), and close the file. To style the application with XAML styles, continue to the next quickstart.